Sencor Element 7 version 3 is a standard Q8 format, A13 based tablet. Supported, but lacks mainline kernel support and likely some driver support in sunxi kernel. Use the q8_a13_tablet build target. Use the sun5i-a13-sencor-element7v3.dts device-tree binary. Either Vol+ or Vol- button triggers FEL mode. Simply hold the button and then connect to the USB port. No success entering Boot1 for me, but ./fel version, LiveSuit/PhoenixSuit flashing and booting over USB works fine. The device is of typical cheap chinese quality, so if you happen to be already inside it playing god, it may be worthwhile to check for hardware problems. Identical with Q8 Format disassembly. To access the PCB backside, unplug the three flex cables and unscrew the three PH0 screws. Turn the board over on the battery, then remove the plastic cover glued to the backside. UART solder pads are in the middle on the back-side of the PCB. 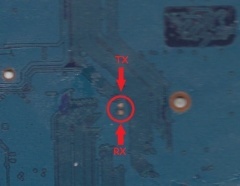 Device's TX is the one closer to the USB port. Note 1: I am receiving no output during boot or Boot0 FEL mode; only serial_noise seems to work for me. It maps to /dev/ttyS1 (so it needs editing the script.bin or the kernel arguments). Note 2: The diagnostic pads are easily torn off from the PCB (maybe not suitable for soldering to). If despite those caveats you decide to try for yourself, here's how: UART howto. 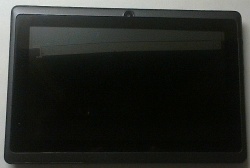 Other Q8 format A13 based tablets. This page was last modified on 31 October 2015, at 19:25. This page has been accessed 7,721 times.